These charts show US household shares in various income groups in constant (that is, inflation-adjusted) dollars. For example, the bottom chart shoes that 24.7% of US households in 2014 earned $100,000+ per year. Mark’s point with these charts is that the Middle Class is disappearing, but they are moving into the upper class. That certainly is true: in both charts, the Middle Class’ shares are lower in 2014 than they were in 1967. I think is also a major take-away from this is the decline in the Lower income group as well. In both cases, the Low-Income group’s shares are falling as well. In real terms, this means that fewer and fewer US households are in the bottom levels of society. So, the rich are getting richer, but the poor are getting richer, too. This data is confirmed in a report by the Financial Times. Freedom of movement is one of the essential freedoms (the others being trade, self-defense and speech). Freedom of movement prevents all kinds of tyranny, not only government-imposed, but also privately-imposed. Concentration of power is only effective because it is concentrated. The US government only has power over the US. The New Hampshire General Court only has power over New Hampshire. Unitil only has a monopoly in Southern New Hampshire. By being able to move out of these areas, it limits the ability for the powerful bodies to exercise their power on any given individual. This also explains why it’s damn near impossible for monopolies to form outside of government protection. Even if a store has 100% market share in a particular region, one can always use his freedom of movement to go and shop at another store. Therefore, it reduces any kind of monopoly (or monopsony) power a firm might have in normal (that is, no government interference) conditions. Especially, in this digital age, this movement is very easy. It needn’t even be physical. From my apartment, I can shop from anywhere in the world. Wal-Mart’s ability to “exploit” their workers or “exploit” their customers is severely limited by the fact people can choose to patronize other locations. As long as people are free to move, then any claims of monopoly and monopsony in a free market are highly suspect and should be subject to extreme intellectual scrutiny. One of the common arguments for the welfare state is that charity cannot solve all the world’s ills, that government must step in to fill the hole. But charity is not the only game in town; it’s not an all-or-nothing proposition. The gigantic elephant in the room, the one with the most power to create wealth, is the free market. The market’s power to combat social ills (such as poverty and all its associated ills like malnutrition) is gargantuan. Since the fall of the Soviet Union, the world has moved toward more economic freedom. During this same time, we’ve seen global poverty plummet , violence fall, food consumption in the developing world increase, and all manner of other good things. Jason Furman, President Obama’s economic adviser, did a study finding that Wal-Mart alone saves Americans about $895 per person per year. Charity can supplement the good works done by the market. It can help those who fall through the cracks. Charity is an important aspect of life. Markets can do the hard work, and charity can help finish up the job. Government, too can help by ensuring fair play: protecting the rights of everyone. Oh come on, please don’t use a fictional place to prove a point. I enjoyed the Hunger Games books and movies as a revolution to knock off the bad guys. But the economics in that society make no sense. The author can make any society as rich or poor as he/she wishes, regardless of how real societies evolve. Do I really need to point this out? This commentator is right that an author can make a book say pretty much anything they want, but fiction can still be a useful way of looking at society and learning economics. You can re-read my posts on the economic lessons of Mass Effect beginning here. I also recommend Josh Hall’s Homer Economicus. Thomas Piketty does this in his book Capital in the 21st Century. We could also cite any number of allegorical works, such as Animal Farm, Aesop’s Fables, Dr. Suess, The Giver, the list goes on! The practice of using parables to make points is literally ancient, going back to at least Socrates. Fiction can be a powerful tool for helping to think about society and economics in an easy manner. Of course, what makes things difficult is keeping the comparison apt. In Rousu’s article, he uses real world examples to make his case. He relates actions in the book to actions in the real world that had similar outcomes. If I wanted to write a fictional story about how communism makes everybody happy and well off, that would be significantly harder to relate to real life, as there are no examples to pick from. I love fiction. I love science fiction. I love stories. And I love economics. When I can combine my loves, it makes for a good day. Over at Cafe Hayek, Don Boudreaux has a great post on the virtues of entrepreneurship. His post is full of the good side of successful entrepreneurship (let’s call that positive entrepreneurship). But there is also good that comes from unsuccessful entrepreneurship (let’s call that negative entrepreneurship). It’s weird to think of failure of having a good side. For those who fail, it certainly doesn’t seem good. For those who risked it all and lost, it can be hard to see the positive. But failure teaches us what not to do. Why is knowing what not to do important? For the simple reason we do not live in Heaven. Ours is a world of scarce resources. There simply aren’t enough resources to satisfy every want out there. So, we need to allocate our resources to their most productive uses. And that is where failure comes in. When schemes fail, it is a signal that the resources were not deployed in their most efficient manner. They were not employed serving others’ or their owners’ needs. Or their deployment was too costly, that there were other resources available that could meet the same need with less cost. If failure is not allowed in an economy (say, firms are bailed out or protectionist tariffs are passed, or subsidies given), then the signals the failure provides are not properly transmitted. This encourages the continued misuse of resources, diverting them from more useful causes and can lead to shortages. Positive entrepreneurship is important, if it weren’t for success our lives would be stagnant, but we should not discount the learning process negative entrepreneurship provides. Are Stagnant Real Wages Here To Stay? 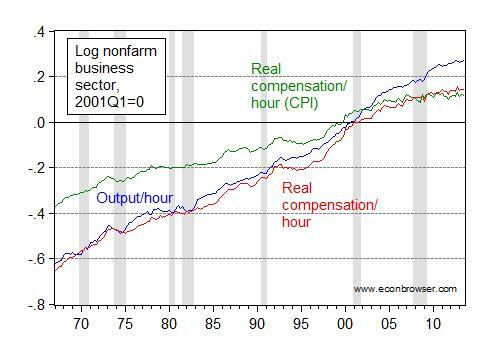 Real total compensation has been rising. Given that the total is rising and one aspect (wages) is stagnant, this would suggest benefits are increasing as a share of total compensation. In fact, this has been happening. US government data (as reported by the Kaiser Foundation) shows wages’ share is falling (see Figure 2). The Heritage Foundation confirms this trend. Looking at this data, it is likely real wages up to this point were stagnant because of increasing benefits. So, what does that mean for real wages going forward? I postulate that, as more and more benefits increase (and indeed, some become mandatory), we will likely see real wages remain stagnant, and possibly even decline. Should my hypothesis be correct, it could have dire consequences for employee policy prescriptions: programs like Obamacare, or mandatory parental leave, could actually increase income inequality for workers. These kinds of programs could actually harm workers by reducing their monetary take-home pay. Stagnant real wages may be the new normal.